Neuroimaging study of brain networks maps differences in children with OCD. A new study by researchers from Wayne State University, University of Toronto and University of Michigan demonstrates that communication between some of the brain’s most important centres is altered in children with obsessive-compulsive disorder. The research sheds significant light on understanding how brain networks contribute to obsessive-compulsive disorder in children. The opensource study is published in the journal Frontiers in Human Neuroscience. The study included patients with a diagnosis of OCD and a comparison group free of psychiatric illness. The team used functional magnetic resonance imaging, or fMRI, to collect brain responses while participants engaged in a basic working memory task. Task difficulty was varied to evoke activity in a core brain sub-network responsible for implementing complex processes such as cognitive control. Then, using sophisticated network analyses, the researchers quantified differences in brain network function between the two groups. The current study shows that the dorsal anterior cingulate cortex, a key region of the brain associated with cognitive control, exerts exaggerated brain network effects in OCD. The team state that this result provides a putative scientific framework for what clinicians have noted about OCD-related behaviours. The researchers explain that these network-based effects have been suggested, but not explicitly demonstrated before in brain imaging data in the disorder; adding that their studies are perfectly aligned with the renewed emphasis of the National Institute of Mental Health to discover mechanisms of neuropsychiatric disease in the brain. They go on to say that if the medical community can discover a reliable mechanism underlying disease, they have the promise of improved pathways toward treatment. The team state that the results are highly consistent with observations in the clinic. Children with OCD are beset by preoccupations and can’t easily move on from certain tasks and behaviours. As all complex behaviour arises from brain networks, being trapped in this mode must arise from impaired brain network interactions in OCD. The team’s previous studies focused on assessing the structure and the neurochemistry of the anterior cingulate as the researchers had long suspected that brain network interactions originating in this region are impaired in the disorder. Now, the team surmise that this is the first study to clearly demonstrate this. Dysfunctional activation profiles in OCD (relative to controls) are depicted for both (A) the 1Back level of memory and (B) the 2Back level of memory load. Increased activation in OCD (p < 0.05, cluster level) is depicted on identical ascending mosaics of axial views. These activation profiles indicate increased activation in dorsolateral prefrontal cortex (dPFC), the dorsal anterior cingulate (dACC), and the parietal cortex in OCD. Notably the degree of dysfunctional activation in OCD scales as a function of memory load. We speculate that the parametric demands as expressed in dysfunctional activation profiles load disproportionately in OCD participants. As will be seen, brain network profiles in OCD do not strictly follow activation patterns, evidence that signatures of network interactions may complement psychopathology revealed in activation models. 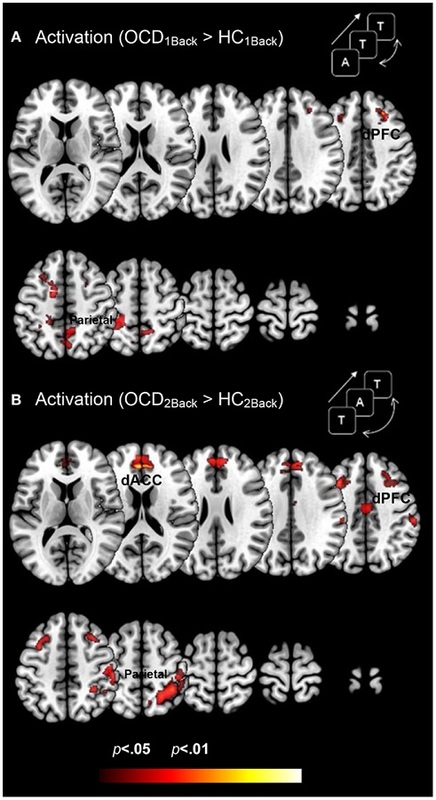 Dysfunctional activation and brain network profiles in youth with obsessive-compulsive disorder: a focus on the dorsal anterior cingulate during working memory. Rosenberg et al 2015.